﻿ Q299: How do I setup my DOKU account to accept payments for the reservations? FAQ Q299: How do I setup my DOKU account to accept payments for the reservations? 1111/D2cT4nAe1De1 - production Mall ID and Shared Key credentials. You can find Mall ID and Shared Key in your DOKU backend. Click Manage Merchant in the menu on the left. In the view that opens, find the merchant that you want to integrate with planyo. The Mall ID will be listed in the first column. In order to find Shared Key, click Edit on the right. The value will be listed on the page that opens (see the image below). Note that each time you re-generate the key, you need to enter the new value in planyo to make sure valid credentials are always used. Additionally, you will need to change the URL Notify and URL Redirect urls. On the Edit Merchant page (see the image below), go to the URL Notify field and enter https://www.planyo.com/payment-doku-ipn.php. This way, after a successful payment made by the customer planyo will be notified about it through the callback URL and information about the reservation payment will be updated in our database. In the URL Redirect field, enter url of the page on your website where you want the customer to be redirected after making a payment. This can be a page containing a thank you note. 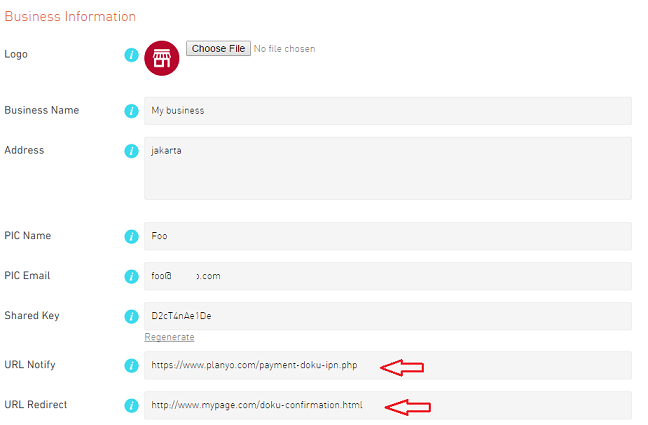 Note that customer's email address is required when redirecting to DOKU for payment confirmation. Because of this you should make the email address field in the reservation form required as well.